With the holiday season quickly approaching, many of us are in search of delicious recipe ideas for family meals, dinner parties and potlucks. 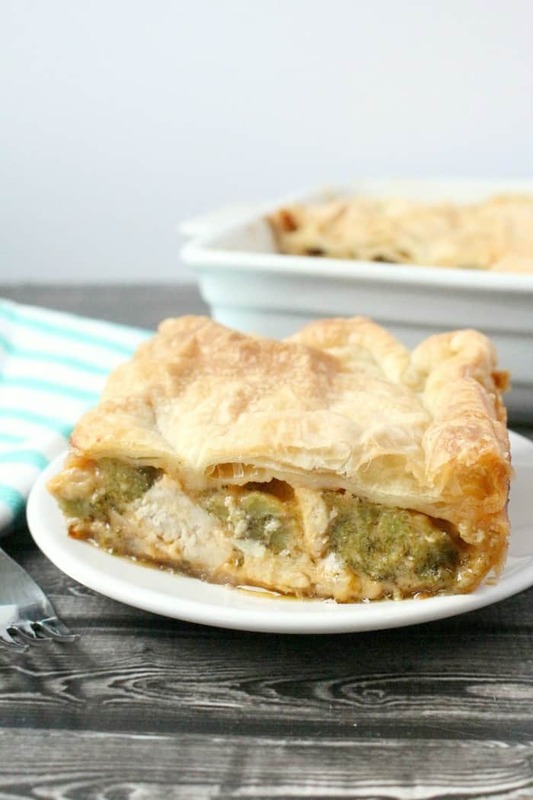 With everything going on during the busy holiday season, I turn to easy recipes that everyone will love so I don’t have to spend too much time in the kitchen. 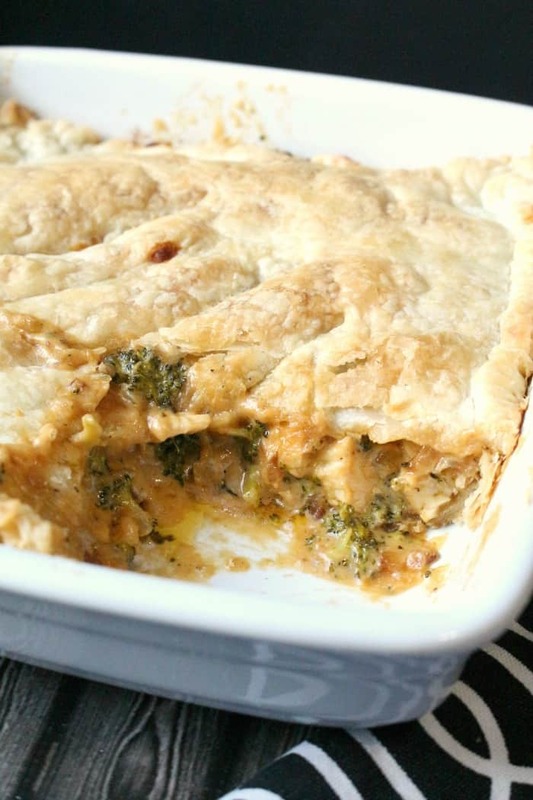 I was recently introduced to the new Tenderflake Rolled Puff Pastry Sheets and I’ve made four casseroles with them within the last week. I think it’s fair to say that I’m a fan of these pastry sheets! They’re made with simpler ingredients just like you would find in your pantry at home – flour, margarine, water and sea salt – plus they don’t have any added preservatives, colours or flavours. They roll out into a 10” x 10” square and they are really easy to handle. They weren’t sticking to my hands or falling apart as I lifted them up to work with them. From breakfast bakes to family dinners to desserts, the recipe possibilities with these pastry sheets are really endless. 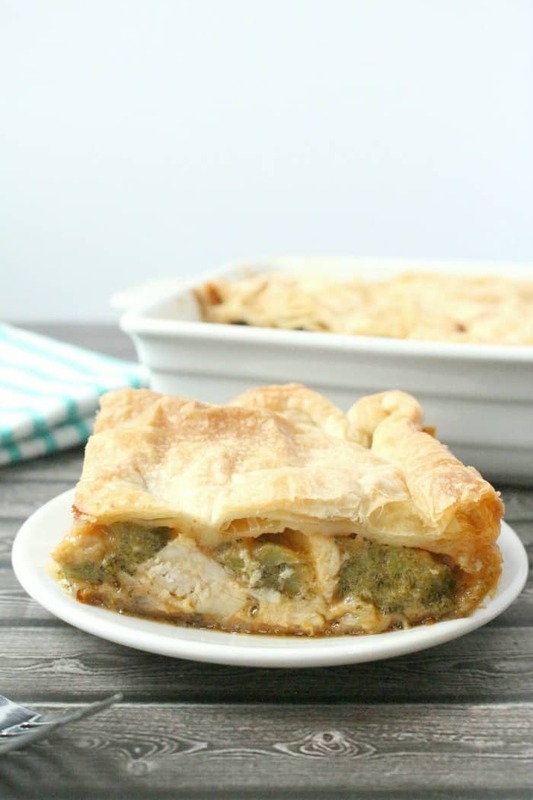 For today’s recipe, I’m going to share a delicious family meal idea with you that tastes just as great the next day as leftovers! 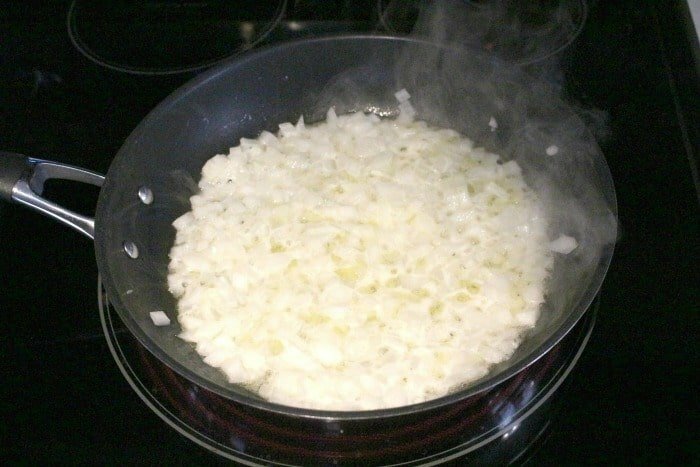 In a large frying pan, sauté onions with butter until onions start to brown slightly. 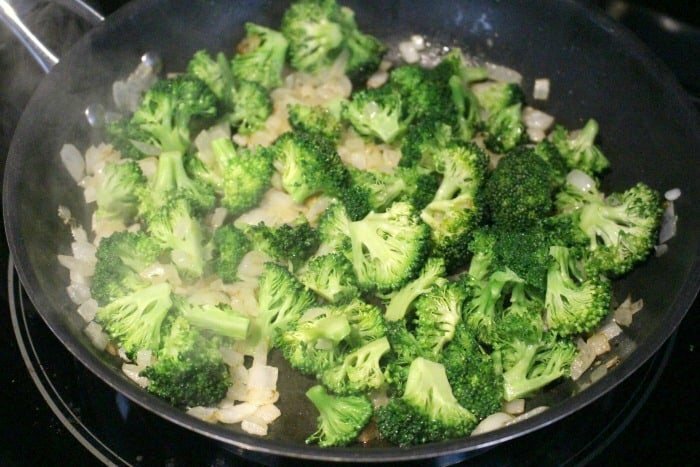 Add broccoli to frying pan and cook with onions (over medium heat) for 5 minutes. 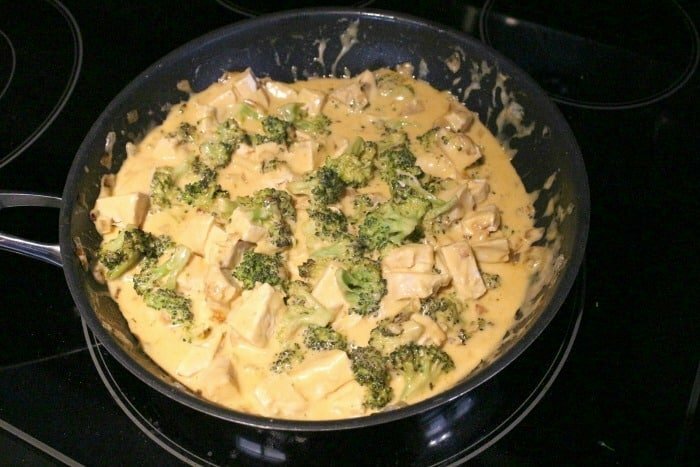 Reduce heat to low-medium then add soup, heavy cream and shredded cheese to broccoli mixture. Stir well to mix. Simmer on low heat for about 5 minutes until sauce slightly thickens. Add chicken to mixture and simmer for 5 minutes. 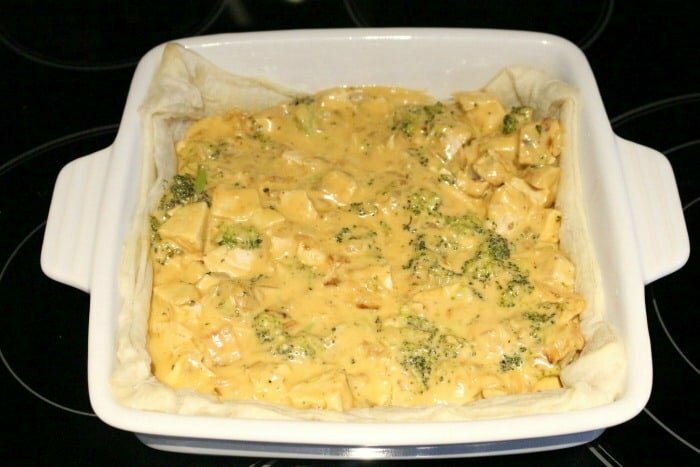 Lightly spray a 9” x 9” baking dish with non-stick cooking spray. 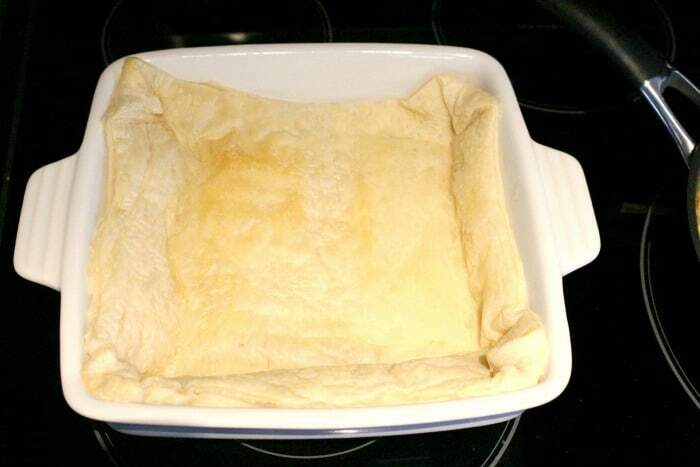 Unwrap one of the Tenderflake Rolled Puff Pastry Sheets and gently lay it in the casserole dish pressing the sheet down firmly against the bottom and inside sides of dish. 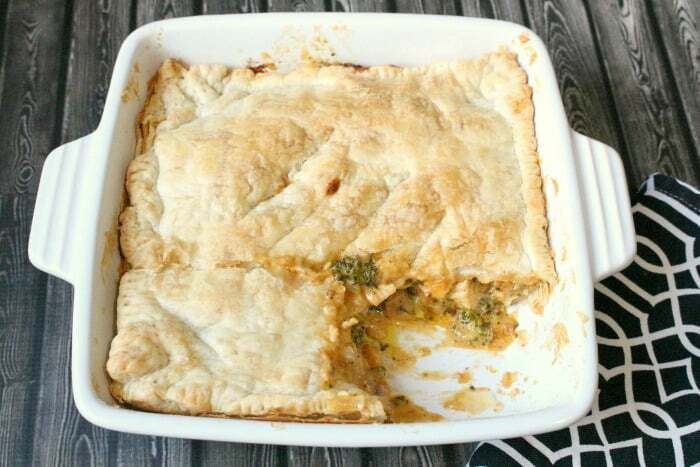 Remove from the oven and use a fork to gently press down the sides and bottom of the pastry sheet. 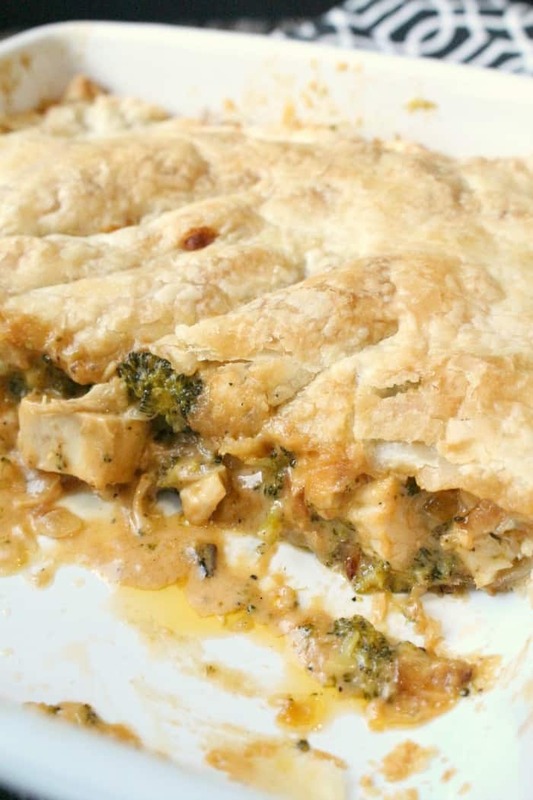 Pour the chicken mixture into the prepared pastry shell. 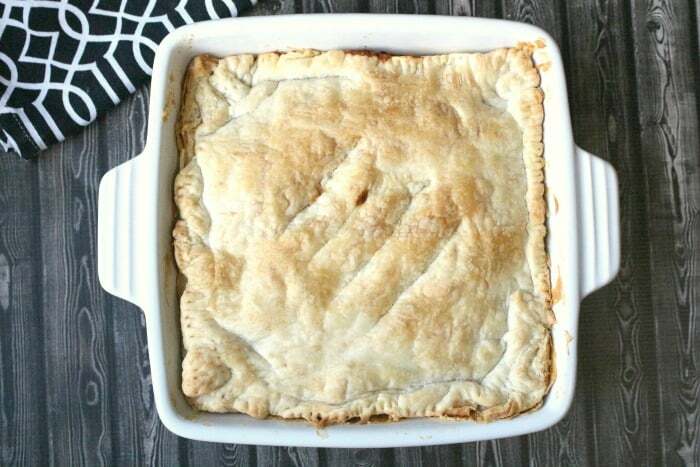 Place the second unbaked Tenderflake Rolled Puff Pastry Sheet over top of the mixture. Press edges together and crimp with a fork. 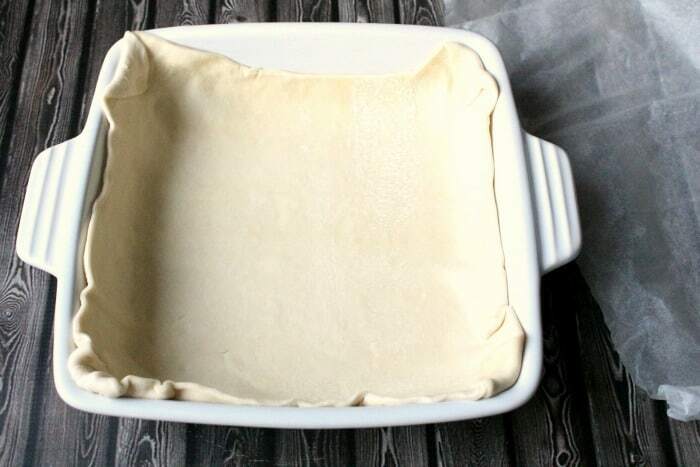 Cut 3-4 lines in the top of the unbaked pastry sheet to allow heat to escape while baking. Bake for 30 minutes (until top pastry sheet is golden brown). Serve hot. 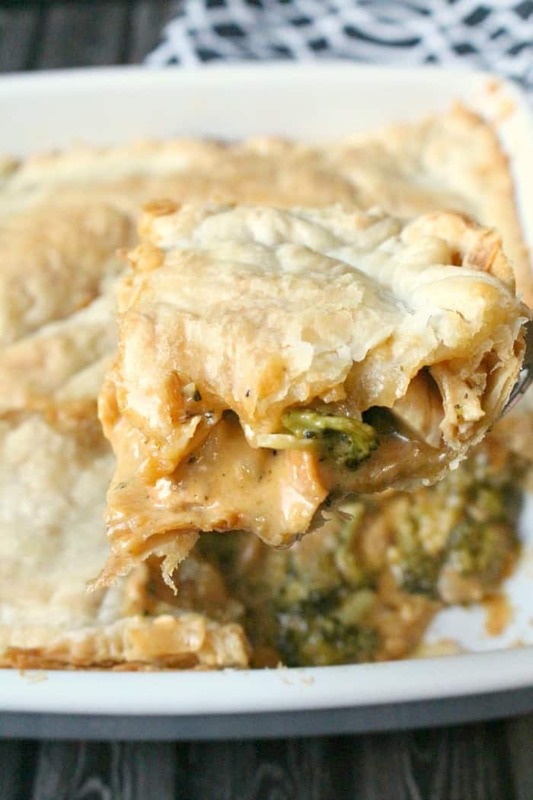 This recipe is really easy to make but I’ve also included step-by-step instructions to show you how to prepare this delicious family meal. 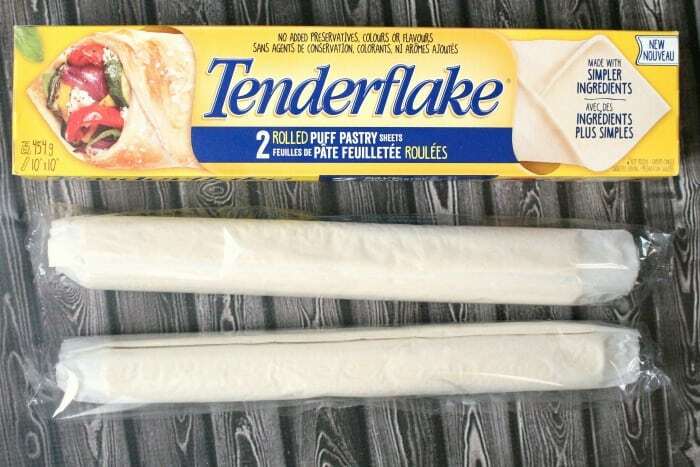 Step 1: Remove both Tenderflake Rolled Puff Pastry Sheets from box and allow to thaw in their packaging at room temperature for 2 hours. Alternately, they could thaw in the refrigerator overnight. Step 2: In a large frying pan, sauté onions with butter until onions start to brown slightly. Step 3: Add broccoli to frying pan and cook with onions (over medium heat) for 5 minutes. 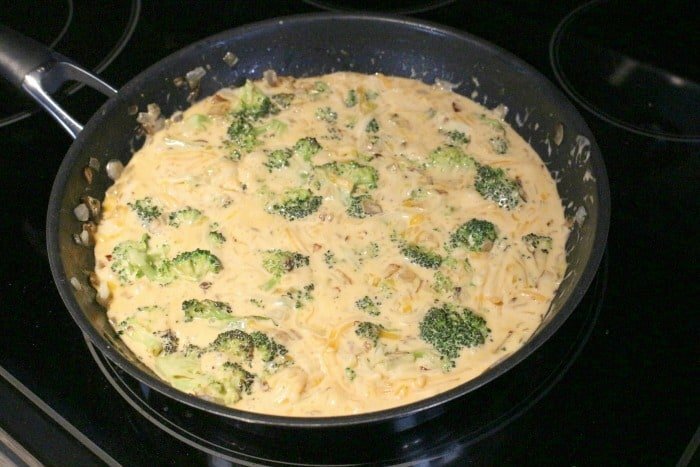 Step 4: Reduce heat to low-medium then add soup, heavy cream and shredded cheese to broccoli mixture. Stir well to mix. Simmer on low heat for about 5 minutes until sauce slightly thickens. Step 5: Add chicken to mixture and simmer for 5 minutes. Step 6: Lightly spray a 9” x 9” baking dish with non-stick cooking spray. 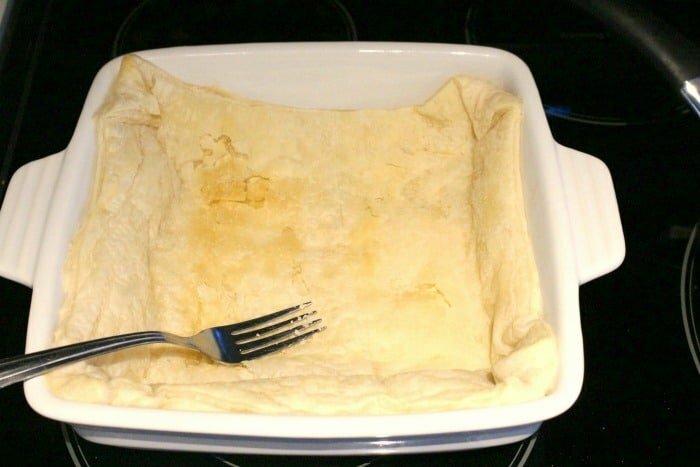 Unwrap one of the Tenderflake Rolled Puff Pastry Sheets and gently lay it in the casserole dish pressing the sheet down firmly against the bottom and inside sides of dish. Step 7: Place the baking dish in the oven and bake for 15 minutes. 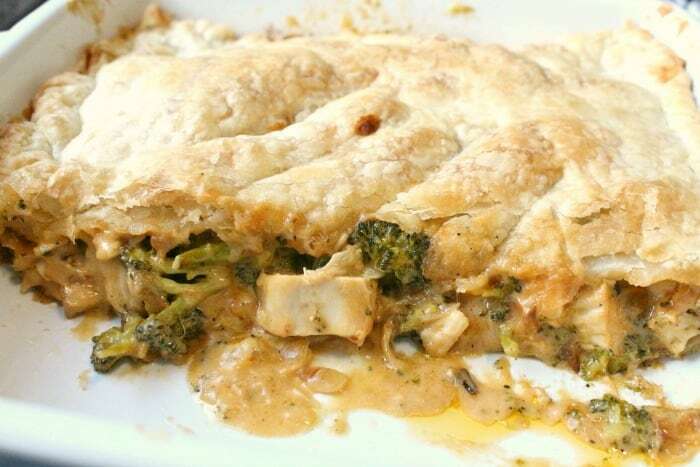 Remove from the oven and use a fork to gently press down the sides and bottom of the pastry sheet. Step 8: Pour the chicken mixture into the prepared pastry shell. Step 9: Place the second unbaked Tenderflake Rolled Puff Pastry Sheet over top of the mixture. Press edges together and crimp with a fork. 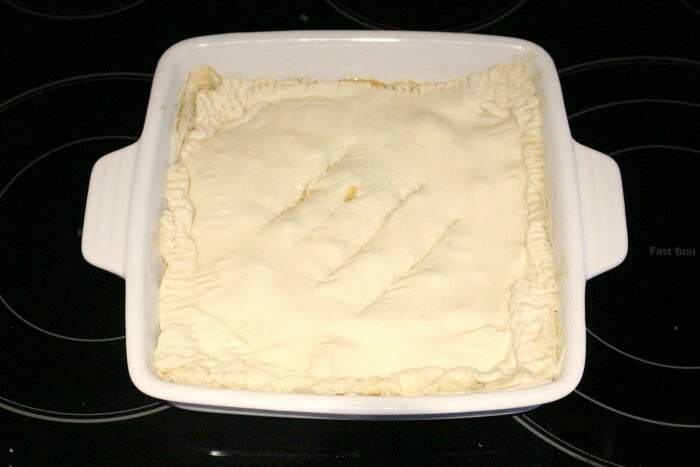 Cut 3-4 lines in the top of the unbaked pastry sheet to allow heat to escape while baking. Step 10: Bake for 30 minutes (until top pastry sheet is golden brown). Serve hot. For more delicious recipe ideas, visit Tenderflake.ca. They have a large selection of delicious & easy recipe ideas for breakfast, appetizers, dinner and dessert!